Panasonic is announcing a reworked 12.1-megapixel Live MOS sensor and a revised design so as to optimize the signal-to-noise ratio (SNR). At times hampered by a slightly smaller sensor than those of the Sony NEX or Samsung NX lines, Panasonic’s redesigned 4:3 sensor uses two noise filtering methods, 3DNR (3D noise reduction) and MNR (multiprocess noise reduction), and is supposed to offer a lower SNR. At 225 grams, the GF5 weighs the same as its predecessor, the GF3. Compacts hybrids have made enormous progress in terms of reducing focus delay and according to Panasonic, the GF5 can focus in 0.09 second, or in other words, the same performance as the GX1. We are now in the realm of instantaneousness. As with previous generations of Lumix G cameras, the GF5’s autofocus continues to improve its comfort and ease of use. Now users can control which zone to focus on by a simple touch of the finger. Touching a subject on the screen can also trigger subject tracking as well as trigger a shot. The “pinpoint AF” option is a kind of spot autofocus for use with delicate subjects within a very small range, or when the depth of field is limited. The GF5 offers Full HD video mode (25p / 50i) — very attractive when coupled with continuous autofocus (just like a camcorder), which distinguishes the GF5 from the majority of HDSLRs that are far less practical when it comes to video. The basic format is AVCHD, but the GF5 can also record in MP4 for easy viewing or editing without prior conversion. The Panasonic GF5 does not have a microphone jack; however, it does have a built-in stereo microphone that records in Dolby Digital Stereo and has a high-pass filter for mitigating the effects of wind. 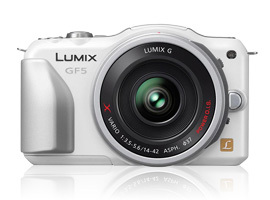 Combined with a Lumix G X 14-42mm lens, the GF5 offers an ultracompact configuration. Though still a 3-inch screen, its resolution dramatically increases from 460,000 points on the DMC-GF3 to 920,000 points on the DMC-GF5. In addition to giving users access to various settings, the touchscreen allows users to lock the autofocus on a subject, to take shots, and with motorized lenses (such as the Lumix G X 14-42mm and Lumix G X 45-175mm), to control the zoom via the touchscreen. There is also a button on the Lumix GF5 that lets the user access the “Q menu,” a handy shortcut to the most common settings. The GF5 is enhanced by a 920,000-point touchscreen and a redesigned graphical user interface. Users will also notice a radical change in the menu layout and a much better design of the graphical user interface. The number of art filters increases from 6 for the GF3 to 14 for the GF5 with the arrival of the Soft Focus effect (which the GF3 lacked), cross treatment or star effect to bring out the twinkle of lights in the night, low-key mode, and even the pinhole effect. In iA or iA+ (so-called “intelligent”) modes, the GF5 detects the scene and recommends a selection of artistic filters. Taking advantage of Live View, the Panasonic GF5 allows users to see the filter renderings right when shooting. The GF5 will hit the market this coming May, just in time for the high-tech photography shopping season that precedes summer vacation. It will be sold with a standard 14-42mm lens for 549 euros; for 699 euros, the camera will come with a miniaturized and motorized Lumix G X 14-42mm lens (this latter model will be called the GF5X). The GF5 has the good sense to offer a built-in flash, which is obligatory for an amateur camera, but not always found in compact hybrids.